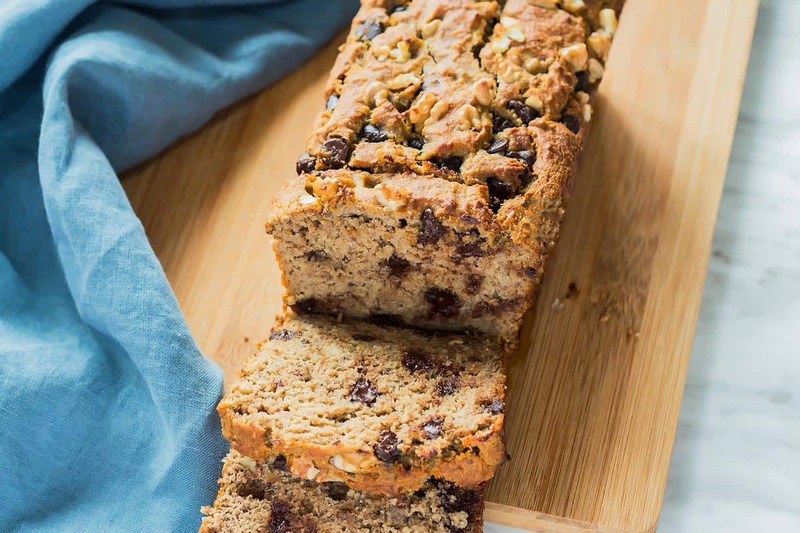 This amazing Coconut Flour Banana Bread Recipe is gluten free and only sweetened with bananas (no added sugar). 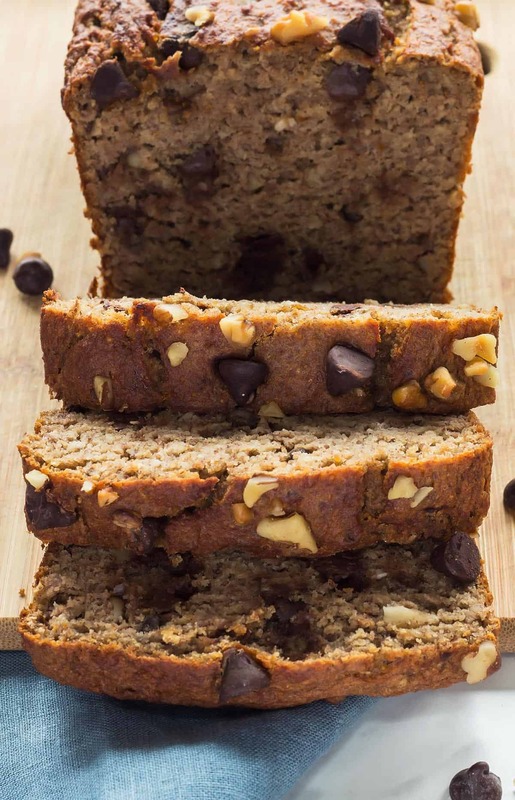 This banana loaf can also be made paleo and tree nut free. I’ve been promising you a recipe for banana bread made with coconut flour ever since I posted this coconut flour bread recipe. That’s been over a year now – so it was high time for the banana bread version! But I had kind of forgotten about it, until I was visiting my mom in Canada recently and saw they were selling bags of overripe bananas for baking in the supermarket. I thought those would be perfect for banana bread which brought me back to my old promise. To be honest, I expected it would take several rounds of recipe testing to get this banana bread recipe just right. Because that is what happening with the original coconut flour bread. But to my happy surprise, it came out perfect on the first try! Of course I tested the healthy banana bread recipe again just to make sure that wasn’t beginner’s luck and then I made it another time for photos and to shoot a quick video for you (see below). For the longest time I thought coconut flour could only be used to make small baked treats like cookies and muffins. When I first started using coconut flour, everyone said it makes dry and crumbly baked goods. 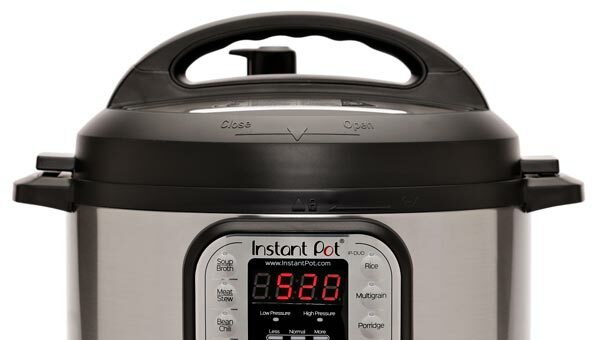 So I found a way to use it for soft and moist recipes. So moist in fact, that I didn’t think they could hold up in larger things like cakes or quick breads. But like I already mentioned, once I figured out how to make sandwich bread with coconut flour, I knew banana bread was possible too. The 2 ingredients that I use in this no sugar banana bread (and not in muffins or cookies) are flax meal and peanut butter. Both of these help to give structure while still allowing for a moist texture. Use super ripe bananas! 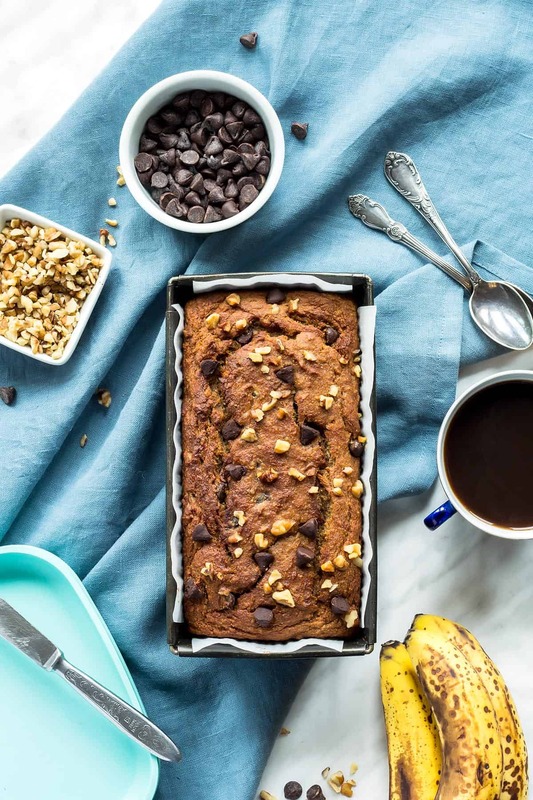 Because this is a healthy banana bread with no sugar added (not even unrefined sugar or syrup) you want to get as much natural sweetness from ripe bananas as possible. Bananas with lots of brown spots are a really good thing for this recipe. Use just one bowl for everything! 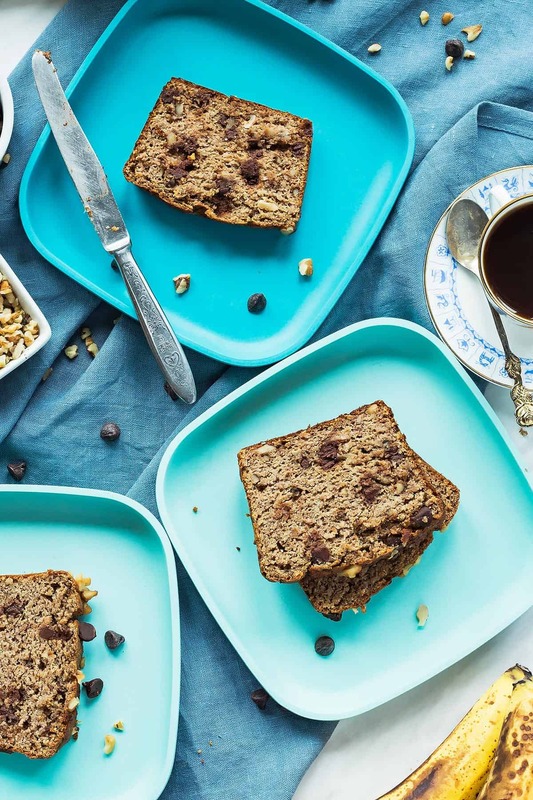 For this simple healthy banana bread recipe there is no need to mix dry and wet ingredients in separate bowls first. Use an extra large bowl and start with mashing the bananas. Then stir in the wet ingredients and finally the dry ones in the end. Be sure to use a deep loaf pan. A regular 8×4 or 9×5-inch size works well, but it should also be 3-4 inches deep to be able to hold the batter with room to rise during baking. Line the pan with parchment paper for easy removal. It’s easiest to use 2 strips – one that covers the width and another long and thin strip to cover the length of the pan. 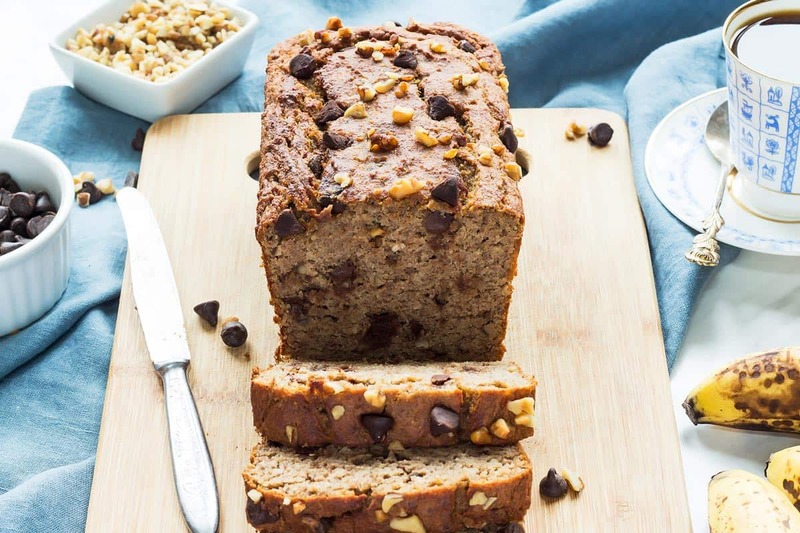 To make paleo banana bread simply use another nut butter that isn’t peanut butter. Almond butter works great in this recipe. If you are using coconut flour because you need gluten free and nut free recipes, then you still have ways to make this bread. Use a seed butter! Tahini (sesame butter) would be my first recommendation. Just give it a try to make sure it isn’t too bitter, which would give the banana bread a slight bitter flavour note too. You can also try sunbutter (sunflower seed butter). But be aware that sunbutter reacts with baking powder and soda. As the banana bread cools it might turn a shade of green, which may be a little startling but the banana loaf will still be totally safe to eat. Because this gluten free banana bread is quite moist, I recommend storing it in the fridge after it first cools down to room temperature. Store it in a airtight container and it will last about a week. Let the slices come to room temperature before eating or pop them in the toaster to warm up. 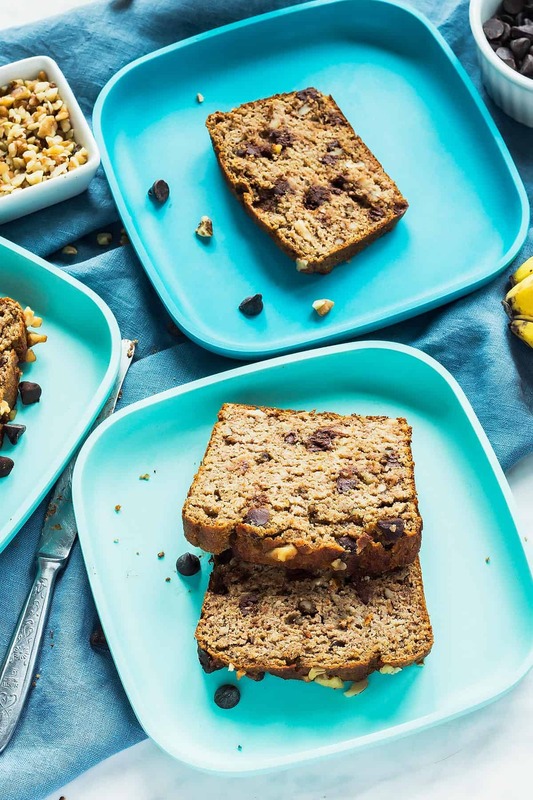 At room temperature this healthy banana bread lasts about 2 days. You can also tightly wrap the loaf in parchment and plastic wrap to freeze it for a later time. Store in the freezer for 2-3 months. I used an extendable loaf pan at about the 9×5 inch size setting. You can use any regular 9×5 or 8×4 pan just make sure it is a deep pan. About 4-inches so that it can hold all the batter with room to rise without overflowing into your oven. When it comes to paleo and allergy-friendly baking I love using the Enjoy Life chocolate chips. Especially their dark morsels. I love using parchment paper when baking with coconut flour. It keeps the banana loaf from sticking to the pan and helps with removing it easily. As you might have gathered from this post that I love cooking and baking with coconut flour – simply because it is a healthier alternative to other flour. Which is why I wrote an eBook dedicated to all things coconut flour. Preheat the oven to 350°F. Prepare a 9x5 inch (or 8x4 inch) loaf pan by lining it with parchment paper. In a large bowl mash the bananas with a potato masher or fork until smooth. 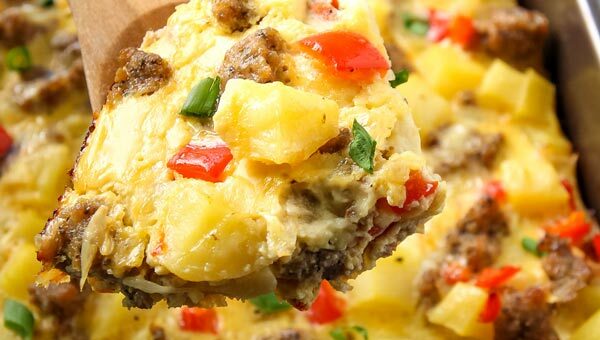 Add the eggs and break them up lightly with a fork. Add the peanut butter and melted coconut oil and stir everything with a spatula or wooden spoon until well combined. Now add the coconut flour, flax meal, baking powder, cinnamon, and sea salt. Stir until combined and no pockets of flour remain. Finally fold in the walnuts and/or chocolate chips. Bake the loaf for about 50 minutes. Then remove from oven and leave loaf cool in the pan until completely cooled. Then turn the pan over to remove the loaf and remove the parchment paper. Enjoy at room temperature or lightly toasted. Store the coconut flour banana bread in the fridge for up to 5 days. It will be fine at room temperature for 1-2 days. *Nut Butter - To make the recipe paleo use almond butter or any other nut/seed butter. To make the banana bread nut free, I recommend a seed butter like tahini (make sure it doesn't taste too bitter) or sunflower seed butter. Keep in mind though that sunbutter reacts with baking powder/soda and the loaf might turn a shade of green as it cools. It will still be totally fine to eat, the colour just might be a turnoff for some. Sweetener - If you want to add more sweetness to the bread without adding many more calories or sugar, I recommend Lakanto Sugar-Free Monkfruit Sweetener. They have syrup as well as granulated options. Sadly no dates so used really good prunes (not soaked and not wet ones), not enough walnuts so added almonds, pepitas, sunflower seeds, a few dried cranberry (really good tang). Also used 5 bananas so added wee bit more flour, baking powder (not much). It was ab fab!! Really wish I could post a pic as half eaten now by visitors. All raved about it. Will definite keep this one! I can not have flax seed or chia seed or the meals. Is there anything else I can use in its place? Also can’t have almond anything. Thanks! Any other flour might have a similar effect as the flax. 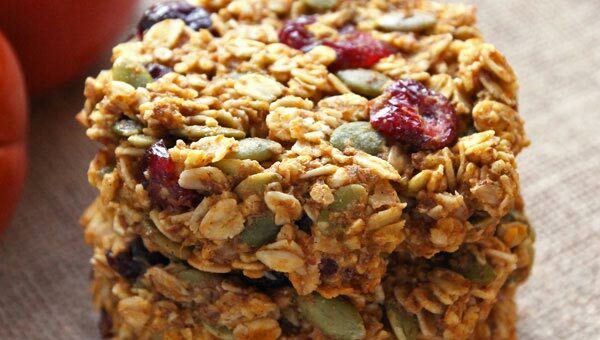 Maybe try oat flour or another nut flour? Delicious! I only had 3 bananas and half a papaya so I used that. It was a little too moist (my guess is because the papaya has no starch), and I’m anticipating the papya enzyme may break down the egg. Will make again! 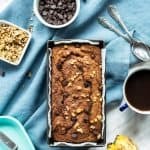 ‍♀️ I would love to try this recipe for banana bread, can ground chia be used to sub for the flax? Wow great to hear it worked with almond flour too. Did you have to use more flour? Can you replace the eggs with chia or flax egg substitutes? Or what would you recommend in place of the eggs? If I wanted it a little sweeter would I add liquid or dry sweetener? In most recipes I use maple syrup (a liquid) in my coconut flour recipes. But to be honest I think this bread is so nice and moist it could also handle a granulated sweetener. I made this tonight! Absolutely divine! They are delicious and healthy and my house smells wonderful! Oh yes!! Banana bread does indeed give the whole house such a delicious aroma. So happy you like the recipe! 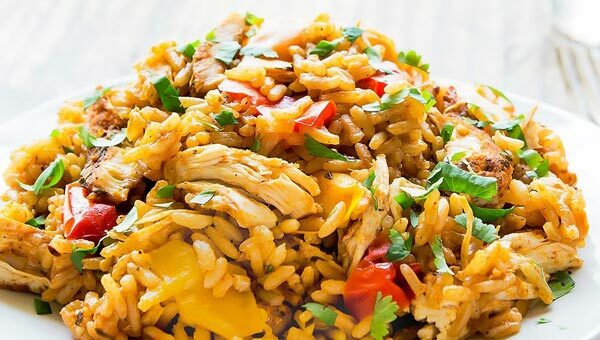 The best part about this recipe is that it’s healthy as well. Love it. 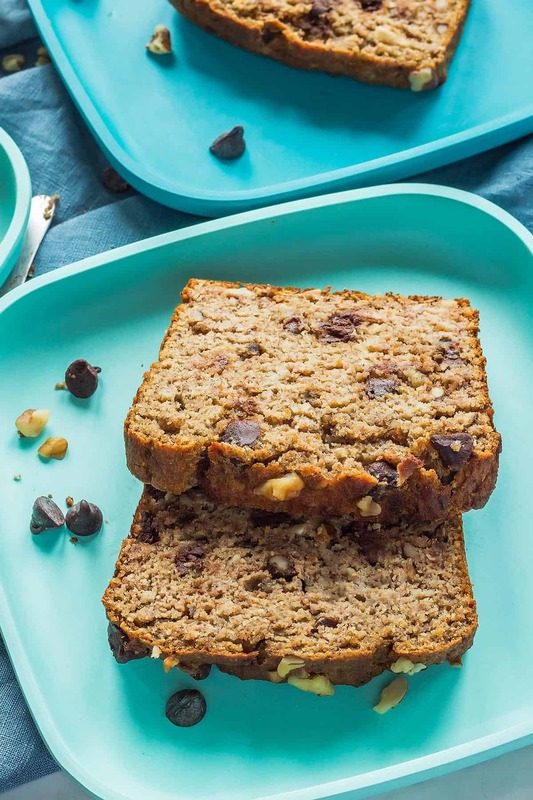 So happy to hear you are loving this healthy banana bread! Trying to learn more 🙂 why is coconut flour more healthy than other flours? Also does it taste like coconut? I really don’t like the taste of coconut. Can I use PB Fit instead of regular peanut butter? 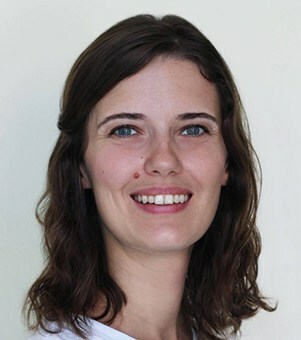 Hi Karen, coconut flour is gluten free and low carb therefore one of the few flours people with certain dietary restrictions can use. It is also cheaper than nut flours like almond flour. I find that when I use it in baking especially with lots of other ingredients like in this banana bread I don’t notice a coconut flavor at all. I used the psyllium husk instead of flax meal and it came out perfect. Thank you! !